The story surrounding the Rose's creation is relatively historic. Built from the remains of the extinct community of Lilmothiit from the ancient city of Blackrose, Blackrose Prison's conception was established during the Akaviri Potentate, under the reign of the infamous Versidue-Shaie. Shaie had given the operation to his battlemage, Pelladil Direnni, who used the rubble of Ancient Blackrose and an army of Stone Atronach to build the Rose within a single day. Despite the name, the Rose is nowhere near modern-day Blackrose, it is in fact day's march south from the city. The prison's isolation was chosen for two major reasons, one was because of the harsh environment. At a certain point of the marsh, non-Argonians would succumb to the climate. Another reason was the presence of the Naga, who are known for their aggression. Because of the rebellious nature of the Naga, this sect of Argonians took a notable portion of the inmate ratio. With the increasing numbers of Naga and the man and mer coming from beyond the province, the Blackrose Prison's security would become at risk, especially with the Naga taking most of the punishment. At one point or another, Blackrose Prison had become abandoned by the Second Empire, whose power had slowly dwindled with the death of Versidue-Shaie and his son, Savirien-Chorak. The exact reason is unknown, but many scholars believed that because of the increasing Naga prisoner population and the dying Empire, Blackrose Prison was ultimately abandoned and the elements had reclaimed it. In the years following it, a renegade group known as the Blackguards, had taken over the Prison. The Blackguards consisted of the descendants of the inmates that were originally imprisoned in the Rose before its downfall. 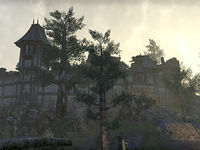 The neighboring tribes of Murkmire were very against the Blackguards' occupation, and so the group had become common highwaymen, eventually becoming the largest criminal organization in Murkmire. Sometime around 2E 583, the Blackguards were under the command of Drakeeh the Unchained, the grandson of the Blackguards' founder. A Bosmeri member of the Thieves Guild attempted to infiltrate Blackrose Prison to retrieve her mentor from the Blackguards, and so she enlisted a group of adventurers to enter the Prison and survive a gauntlet leading to Drakeeh. In the end, Drakeeh was defeated. By 3E 432, Blackrose Prison had been claimed by the Third Empire and was active during the late reign of Uriel Septim VII. In the aftermath of the Imperial Simulacrum, the Rose had contained the associates of Jagar Tharn, the same who impersonated the Emperor and caused the Simulacrum. These associates remained in prison until their dying breath. However, in 3E 432, there was a prison outbreak and several prisoners escaped into the inner marsh of Black Marsh, however, some people believe that they did not make it safely from the swamp. ^ Events of "The Black Gauntlet"
This page was last modified on 14 November 2018, at 22:28.